Salivary Glands: These are the secretory glands or the Exocrine Glands which secrete a multi functional fluid known as Saliva. Saliva which is a combination of many substances with varied functions is a slightly viscous fluid which is composed of many substances which are produced and secreted into the oral cavity by different salivary glands and mix in the oral cavity to form saliva in the mouth. 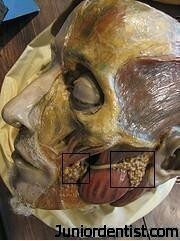 Major Salivary Glands: 3 pairs of large glands located outside the oral cavity. Minor Salivary Glands: Many numerous small glands in the mucosa and sub mucosa of the oral cavity. These are the largest of the salivary glands which are arranged in pairs, and supply their secretions into the oral cavity by the help of ducts which connect the glands to the oral cavity. Parotid Gland: It is present in front of the ear, It is connected to the oral cavity with the help of Stensons Duct which opens near the 2nd maxillary molar. Submandibular Gland: It is present in the submandbular triangle. It is connected to the oral cavity by Wharton’s Duct and it opens by the side of the lingual frenum on the floor of the mouth. It is a mixed gland which secrets both serous and mucous secretions. Sublingual Gland: As we can see by the name Sub-below, Lingual- tongue so it is present below the tongue, It is connected to the oral cavity by the Bartholins Duct, It is also a mixed gland. Labial and Buccal Glands: The glands located in buccal mucosa of cheeks and lips. Glossopalatine Glands: These are present in the Isthmus in the glossopalatine folds, these are purely mucous glands. Palatine Glands: Present in the Lamina Propria of the posteriolateral region of the hard palate and in the sub-mucosa of the soft palate. Lingual Glands: These are known as the glands of the tongue, they are of 2 types the anterior lingual glands and the posterior lingual glands. It initiates the process of Digestion, we can also say that it starts the first stage of digestion. Maintains the oral hygiene, by killing some of the pathological microbes. Lubricates the food and helps in easy swallowing by making the food into a mass of semi digested food known as ‘Bolus’. It maintains the oral cavity and helps in the easy movement of the tongue which help in proper speech. It has anti microbial function as it contains the Immunoglobulins which kill the bacteria and act as the first line of defence . Hey I really like this site, great information and I really like the graphics, good job. Really nice information provided ,thanks for information. Thanks for your response . . . . I really appretiate it if you can give any suggestions on how to make this site more informative and easy to undertand for the newbies who are into dentistry now . . .